A major technology and communications client retained Bishop-McCann to design, plan and execute their 2017 President’s Club Incentive and Recognition trip for 300 attendees. The program objective was to create joy and reward these top performers with a “trip of a lifetime” and to recognize them for their year-long achievements. 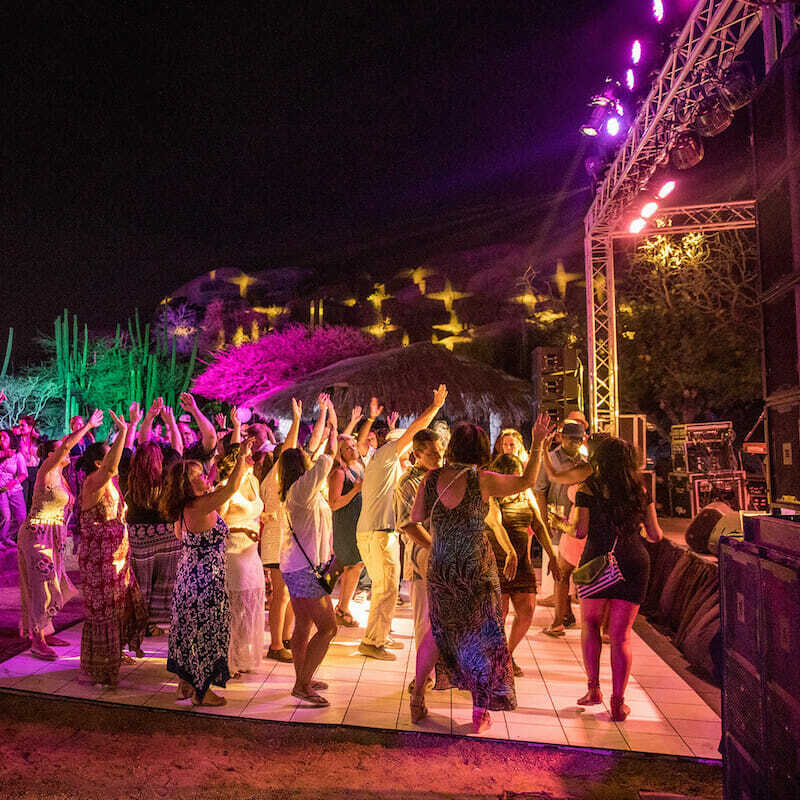 This five day trip, held in Aruba, was designed with the perfect combination of excitement, interaction, activities, incredible immersive events, recognition and most of all – FUN! The program’s theme entitled “Up, Up & Away Aruba” was created to support the 2017 trip and was integrated throughout the program from launch materials all the way through the events. From attendee communications to the custom registration website and communications app to the recognition ceremony and both the on and off property events, the program elevated the attendee experience at every turn. Our in-house production team worked closely with executives to create an engaging Recognition Ceremony starring “America’s Got Talent” finalist Mike Super. Our events team created immersive experiences that ranged from a blow-out beach party to staging a most impressive “white party” created in a dramatic rock formations state park, an experiential island fantasy beach day that was crafted to align with our client’s partner sponsors and a closing night gala that was multi-dimensional and a complete transformation. Bishop-McCann provided a dedicated account team to partner closely with the client. With the attendee experience as the primary focus, our account team flawlessly executed each program component including creative direction, air travel, attendee registration, guest accommodations, food and beverage management, production, event design and décor, teambuilding, speakers and entertainment recommendations and negotiations, tradeshow/sponsorship management and ground transportation. Bishop-McCann achieved extremely high ratings in the attendee surveys. One attendee had this to say; “This trip was heaven on earth. One cannot pick a favorite thing in heaven, but the island and event staff were Superb!” Bishop-McCann took over this program from another agency who had been handling it for over 20 years. The shift was noticeable to the winners as they mentioned the elevated level of service and the kindness of the on-site staff. They also mentioned the increased level of detail on all the program elements. Elevating this trip to the next level will help this telecom company continue to motive their achievers further in the coming years. This was the most amazing experience I’ve ever had on any vacation and drives me to continue performing so I can come back again! This was my 4th time qualifying and this one was the absolute best! First class experience all around, we really enjoyed the UTV excursion and dinner at Ayo Rock was amazing. It’s unbelievable how the team was able to transition the site into such an amazing dinner destination. Awesome! First-timer, I will be back. The attention to detail was outstanding. I feel appreciated. I enjoyed everything but dinner at the Rocks blew my mind.